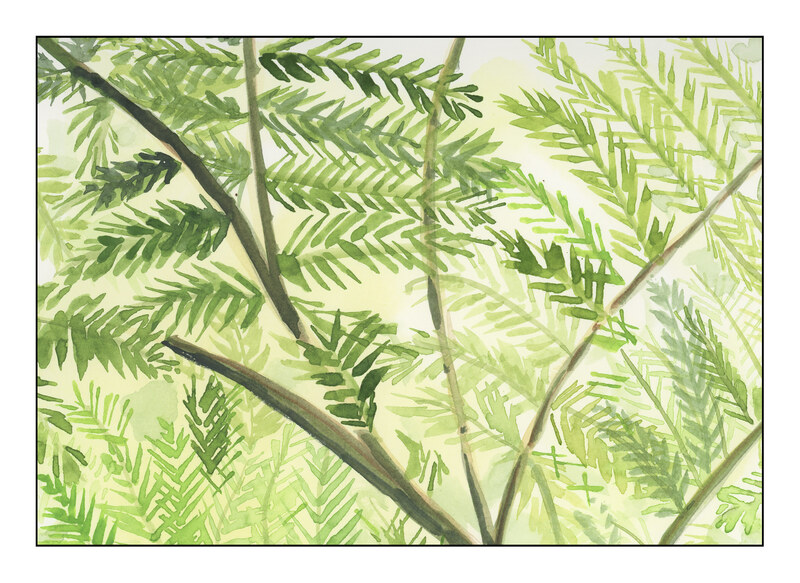 This morning I decided to do a free form watercolor of the tree ferns I photographed. I didn’t draw in any lines. As you can see, the stem on the left goes nowhere…amazing how you notice things when you see them in a scan! The main purpose of the exercise was to use a 1/2 inch flat brush for most of the work. To do the fronds, I used the tip, but in reality such is a better way to express palm fronds. Tree ferns have a softer, more rounded shape at the ends of their leaves. Consequently, I pulled out a small round. If you know the art of sumi-e, I am sure you can figure out how to make the softer, rounder tip of a tree fern. To do it, start with an upright brush and slow squish it down toward the end. That would be for the stem-t0-end-of-leaf. If you want to begin at the end of the leaf, squish the brush and then lift it as you move inward. Doing either produces better results I think. I also just wanted to work on colors and shapes, try to get some contrast, too. As I painted, I imagined living in a jungle of tree ferns – looking up, sunshine, contrast, sparkles. At 6:30 in the morning, in a rather dark room (with the only light coming in from the eastern window of the studio, and the glow of the computer monitors), it’s always interesting to see what happens – happened – when you see it in the light of day!